This small country church is one of only a few in Herefordshire with no known dedication. 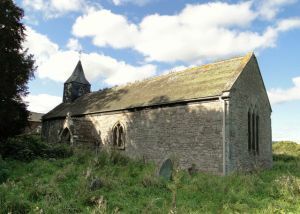 It is a long, low building of local sandstone, with a small timber-framed bell turret at the west end. HG Morgan, the father of the Morgan motorcar inventor, was vicar here, and the house where the younger Morgan was born is visible from the churchyard. Moreton Jeffries church was built in the 13th or 14th century, and restored in the 18th century and again in the Victorian period. The most striking interior feature is the richly carved Jacobean pulpit. The church is no longer open for regular worship and is under the care of the Churches Conservation Trust. NB. There seems to be some doubt as to whether the name of this small east Herefordshire village is Morton Jeffiries or Moreton Jeffries - you'll see it spelled both ways, but we've gone with the 'e' version that appears on OS maps. Location: Signposted off the A465 near Burley Gate. Access via the lane to Moreton House.